This weekend I had the privilege of going to see Why Did I Get Married Too by Tyler Perry. In reality a very similar title, ” So He Cheated, Now What?” is written by Nicole Cleveland. “So He Cheated, Now What” is a guide to overcoming an affair in your relationship / marriage. Pat ( Janet Jackson ) provides tips to trusting your spouse that brings some interesting dialogue amongst the characters in the movie, especially Angela, ( Tasha Smith ). 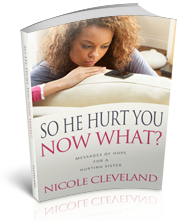 “So He Cheated, Now What” by Nicole Cleveland offers steps to healing and restoration after an affair. “Taking my husband back was the easy part. Rebuilding trust after the affair was the hard part.” says Cleveland. Will I ever trust him again? Purchase the book and share with a friend, sister or co-worker. “So He Cheated, Now What” by Nicole Cleveland is available at www.sohecheated.com and on Amazon. 3 Responses to He Cheated, So Now What ?? Wow! I too saw the movie this past weekend and it bought back to my remembrance the ever so nagging pain that one feels after your spouse has betrayed you. Hats off to Nicole for writing her story so that others can glean and be healed from it. After being married for over 14 years (at that time) and raising 6 children, it was totally devastating when I found out my husband had cheated. We were being deceived to think that in the Church this would not happen. I did forgive him. It took time and much counseling, But with God all things have been possible! Now six years later and we are definitely on a wonderful road of recovery. I also decided to put my story in print, in an effort to help others be healed. “Healing Hurting Hearts,” was just published by AuthorHouse in July 2009. Thanks for sharing I will definitely be purchasing Nicole’s book. I had the opportunity to see the movie with my significant other on Monday….it was awesome! I am not really sure how I would react in a situation like that! I guess its true…you can never really comment on something you have no experience in! Can’t wait to read your book!